Welcome to our online shop! We’re glad you stopped by. 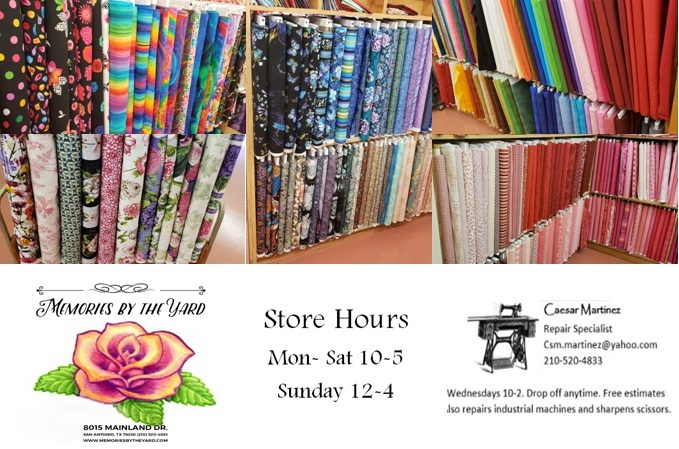 Memories by the Yard is a family owned fabric store located on the northwest side of beautiful San Antonio, Texas. We are dedicated to having a wide variety of first class cottons and wool suitable for quilts, clothing, handbags and home décor projects. We also sell notions, threads, and embroidery floss and perle cotton. Don’t miss our patterns, books, ribbons, trims, buttons, and fun gift items. We carry upholstery fabrics suitable for sofas, chairs, outdoor furniture, and drapes. Home Decor trims and tassels are available to add trendy accents. Our goal is to supply you with high quality goods in a friendly and helpful environment. Each customer is valuable to us and we want you to have a fantastic shopping experience whether in-store or online. Call or email us with any questions or concerns. If you live near us, or are coming to the area, please stop by to visit! Check out our newsletter for special events, classes and sales. We look forward to helping you create memories that last.